This is it - Marathon Week. Nothing I can do now can change any of the effort that I've put in over these past 5 months. All I can do is rest, take care of myself and send good thoughts out into the universe. So here it is universe - I will finish this marathon within four hours and twenty four minutes. A seemingly bizarre number, I realize. 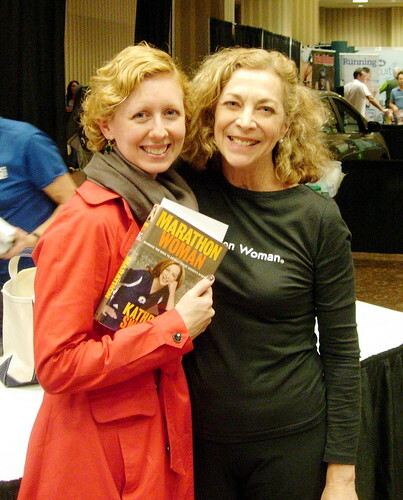 Unless of course you are an avid fan/reader/stalker of Kathrine Switzer. Of which I clearly am. You see when Kathrine Switzer first ran the Boston Marathon in 1967 (and made history as the first woman ever to do so as a registered runner) her finishing time was 4:24. It was her first marathon - the first time she proved to herself and others that she could do the distance. Of course she then went on to demolish the time and concentrate her efforts on a sub 3 hour race (something I probably won't be attempting) but I say pishposh to that - a first time is a first time. I've had a pretty great week of taper runs that included a great Yasso 800 workout last week. Now it's all rest and bon bons until Saturday when I'll do a very short run along the opening stretch of the race course before doing up my shoelaces for the big event on Sunday. Without mincing words - I'm completely terrified. And make no mistake, I have a long list of things that could go wrong pre/during/post race. I just have to keep faith that these past 20 weeks have prepared me for whatever this mofo course can throw at me. Sidenote - I'm also really excited that our hotel is within crawling distance of both a Cheesecake Factory and a Shoe Pavilion. Because if a girl can't have banana cream cheesecake AND buy pretty shoes - then what the hell is this all about? I think people should say pishposh more often. And you'll be great - the hay is in the barn and you are ready to run! I'm so excited for you and your 4.24. The question is, if you are comming in ahead of pace will you wait by the mat for the magic number? p.s. Did KS gush about how lucky you are to have the book in hardcover? She was totally impressed by mine saying you can't even buy the hardcover version anymore, except at overinflated prices on ebay. Good luck on your marathon! We'll be pulling for you on Sunday!!!! and no - if i get to that mat before 4.24 i will cry with happiness, there will be no slowing me down! i wonder if KS will be there? You're going to have a great time on Sunday. Positive thought coming your way! Actually KS is here in TO with hubby RR, I'm buying their 26.6 Marathon Stories direct from the authors tomorrow at the expo. You'll probably catch her in NYC. The marathon web site blows. We've been trying to follow your progress, but can't find that anywhere. Boooooo.